In his Ecclesiastical History of the English People, completed in 731, the Venerable Bede tells of an elderly lay brother, a herdsman named Caedmon, in the abbey of Streonæshalch at Whitby, presided over by the abbess Hilda (died 680, commemorated November 18). Though there must have been many before him, Caedmon is the first poet in English whose name is known to us, as he is also the first known Christian poet in the English language. One source suggests that Caedmon may have been of British origin, as his name is likely an Anglicization of the Cymric, Cadfan. The Venerable Bede writes that at social entertainments, when Caedmon saw the harp coming towards him, meaning that it was soon to be his turn to play and to sing, he would leave the table and return home. “Having done so at a certain time, and gone out of the house where the entertainment was, to the stable, where he had to take care of the horses that night, he there composed himself to rest at the proper time; a person appeared to him in his sleep, and saluting him by his name, said, “Caedmon, sing some song to me.” He answered, “I cannot sing; for that was the reason why I left the entertainment, and retired to this place because I could not sing.” The other who talked to him, replied, “However, you shall sing.” ­ “What shall I sing?” rejoined he. “Sing the beginning of created beings,” said the other. Hereupon he presently began to sing verses to the praise of God, which he had never heard, the purport whereof was thus : We are now to praise the Maker of the heavenly kingdom, the power of the Creator and his counsel, the deeds of the Father of glory. How He, being the eternal God, became the author of all miracles, who first, as almighty preserver of the human race, created heaven for the sons of men as the roof of the house, and next the earth. This is the sense, but not the words in order as he sang them in his sleep; for verses, though never so well composed, cannot be literally translated out of one language into another, without losing much of their beauty and loftiness. Awaking from his sleep, he remembered all that he had sung in his dream, and soon added much more to the same effect in verse worthy of the Deity” (The Ecclesiastical History of the English People, Book IV). Next morning Caedmon told the steward of the gift that he had received, and the steward conducted him to the abbess who, “in the presence of many learned men”, ordered Caedmon to tell his dream and to repeat the verses. 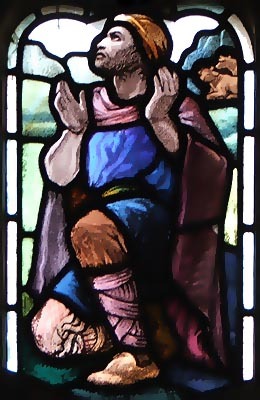 All present concluded that “heavenly grace had been conferred on him by our Lord.” Thereafter, Caedmon put to verse any passage of Scripture expounded to him by the learned abbess and brethren, and Hilda made Caedmon a lay brother among the monks of the abbey, ordering that he should be taught the whole of sacred history. “Thus Caedmon ‘ keeping in mind all he heard, and as it were chewing the cud, converted the same into most harmonious verse; and sweetly repeating the same, made his masters in their turn his hearers. He sang the creation of the world, the origin of man, and all the history of Genesis : and made many verses on the departure of the children of Israel out of Egypt, and their entering into the land of promise, with many other histories from holy writ; the incarnation, passion, resurrection of our Lord, and his ascension into heaven; the coming of the Holy Ghost, and the preaching of the apostles ; also the terror of future judgment, the horror of the pains of hell, and the delights of heaven; besides many more about the Divine benefits and judgments, by which he endeavoured to turn away all men from the love of vice, and to excite in them the love of, and application to, good actions; for he was a very religious man, humbly submissive to regular discipline, but full of zeal against those who behaved themselves otherwise; for which reason he ended his life happily”, ibid. At the end of what Bede describes as a moderate (not life-threatening) illness, Caedmon perceived that death was near and asked to receive the eucharist. Having received communion in his hand, he asked whether all the brethren were in charity with him and free from anger. Replying that they were and asking whether he were in the same state towards them, Caedmon replied, “I am in charity, my children, with all the servants of God.” Taking communion, he marked himself with the sign of the cross, laid his head upon his pillow, and died. Caedmon was commemorated on February 11 at Whitby. He is commemorated on this day in the Calendar of the Book of Common Prayer of the Anglican Church of Canada. None of Caedmon’s poems has survived, save the nine lines recorded by the Venerable Bede in Latin and in several Old English versions among the Latin manuscripts of the Ecclesiastical History extant. The text below is from one of those manuscripts, with Michael Alexander’s translation following (from The Earliest English Poems, Third Edition, Penguin Books, 1991). of every wonder, the eternal Lord. Almighty Lord, the earth for men. Almighty God, you gave to your servant Caedmon singular gifts of rendering the holy Scriptures in verse, that the people of your Church at Whitby might be instructed in the faith and give praise to your holy Name: Stir up the hearts of your people, that they may joyfully sing your praises in this life and the life to come; through your Son Jesus Christ our Lord, who lives and reigns with you and the Holy Spirit, one God, now and for ever. Amen. 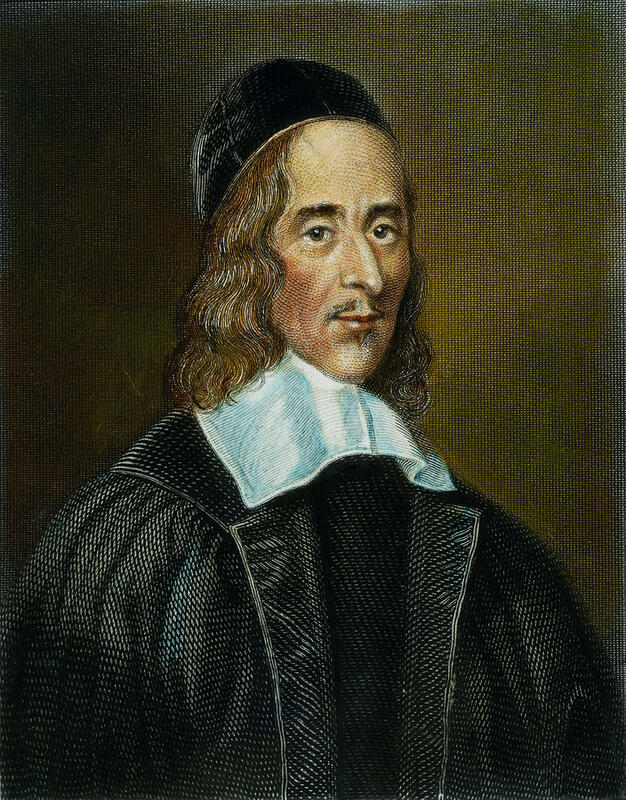 An audio file of Caedmon’s Hymn (in Old English) may be found at the website for the Norton Anthology of English Literature (scroll down to find the file). 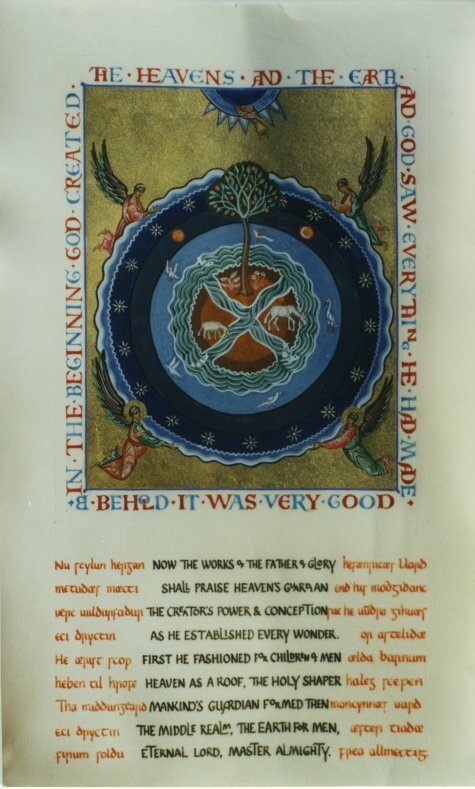 The icon Creation: Saint Caedmon’s Hymn is taken from Aidan Hart’s gallery of icons, and is reproduced here with his generous permission.